With back to school season being here, you can be sure to expect that at least one person in your class, workplace, or extracurricular activities to have a cold, making your risk of catching a cold even greater. Getting a cold may not seem like a very big deal. It isn’t. Yes, it’s unpleasant, but a cold usually tends to go away within a few days. The big mistake is believing your symptoms are just symptoms of a cold. Misdiagnosis could lead to an even bigger problem later on. Pneumonia symptoms are very easily confused with the symptoms of a cold. 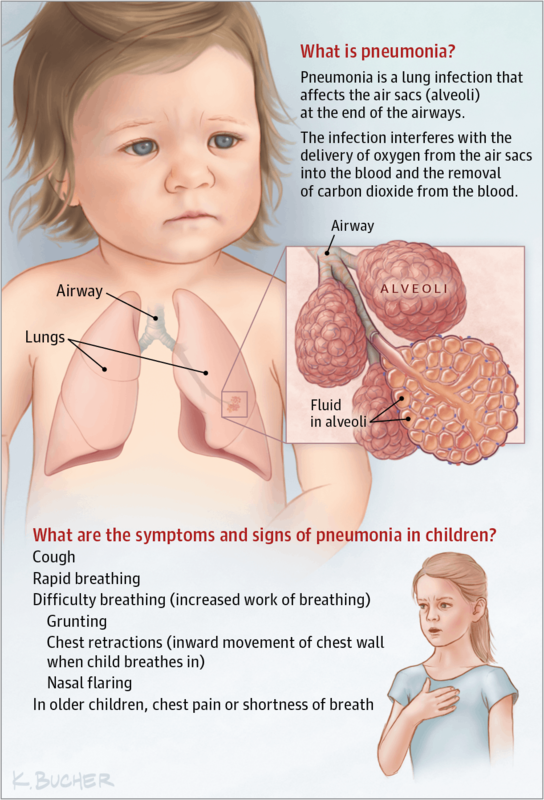 Pneumonia is a lung inflammation that can be caused either by a bacterial or viral infection in both lungs or just one. The air sacs in the lungs, called the alveoli, will fill with fluid and make it very difficult to breathe. Pneumonia can affect one or both lungs, but both conditions are serious and need medical attention. Pneumonia is treatable with prescribed medication from a doctor. However, realizing that you have pneumonia in the early stages of it is the challenge. This illness has very similar symptoms to a cold. Both a cold and pneumonia have the common symptoms of coughing, fever, and chest pain. There are a few things that can help you distinguish the difference between a cold and pneumonia. The biggest difference between the common cold and pneumonia is how long the symptoms last. On average, the symptoms of a common cold last three to five days. Symptoms lasting longer than five days should be seen as a red flag and seeking a doctor is highly recommended. It’s crucial to get treatment for pneumonia as soon possible. Without treatment, it’s very likely permanent lung damage will happen. So, if you don’t see yourself improving within three to five days, make sure to get checked out by a doctor. Other noticeable factors are that for pneumonia, your symptoms will be more severe. Your fever is more likely to be higher and instead of dry coughs, there will be coughs with green, yellow, or bloody mucus. Every case of pneumonia is different for the person. Pneumonia symptoms can be mild or severe, which is why it’s so easy to mistake pneumonia as a stubborn cold that just won’t go away. It’s important to treat this illness as early as possible so if symptoms are lasting more than five days, have trouble breathing, and a persistent fever, make sure to seek medical attention. Preventing pneumonia is very easy. Steps that can be taken towards prevention is getting a flu shot, always washing your hands and more importantly, strengthen the respiratory immunity . Especially during flu season. Cleanliness is very important in maintaining a strong and healthy immune system. Strengthening the respiratory immunity can be done with constant care of the respiratory system – keep good hygiene, clear the mucus and fight infections – all these can be done naturally by using salt therapy at home. The real challenge on the body beings if you become infected with pneumonia. It becomes even more dangerous if your infection becomes viral. Should the infection become viral, medication will be ineffective. Here salt therapy comes even more useful, being natural and safe non-invasive treatment for both prevention and treatment for pneumonia. Salt therapy involves inhaling microscopic salt particles, which cleans your airways, makes it easy to cough out mucus and reduces inflammation. Not only does salt therapy provide easy breathing, but it also provides a speedy recovery. When the salt particles are absorbed by the lungs, it cleanses out the bacteria growth. This will cut off the infection before it spreads and creates more damage. Salt therapy also helps all age groups. Those with especially vulnerable immune systems, like children, and the elderly, benefit greatly from this therapy. With continuous use of salt therapy, your immune system will also become much stronger and make it harder for viruses and bacteria to invade your body. The more often this treatment is done, the better. Your respiratory system will be cleaner, your immune system stronger, and your chance of getting pneumonia significantly decreases. All that you need to do is sit and breathe in salt particles during your night sleep. It cannot be easier than that! When considering which course of treatment is best for possible pneumonia symptoms or even a banal cold, salt therapy is one of the most effective ones. Not only is it natural and safe for all ages, this treatment quickly improves the overall function of the respiratory system while preventing other viruses from entering your body. Rest assured that with salt therapy – your natural treatment for pneumonia – your recovery from pneumonia or preventing pneumonia symptoms will easily be achieved.